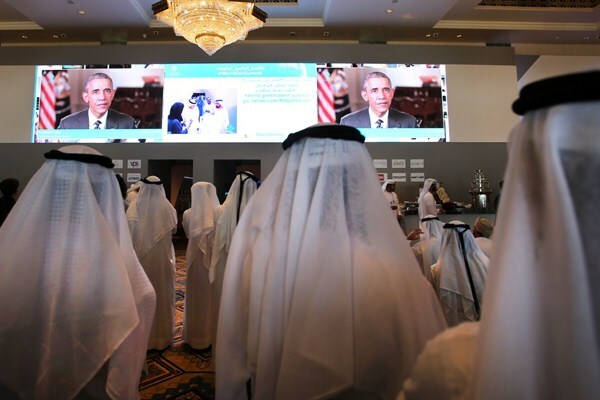 Emirati officials watch U.S. President Barack Obama's address at the opening ceremony of the World Government Summit, Dubai, United Arab Emirates, Feb. 8, 2016 (AP photo by Kamran Jebreili). This week, world leaders are gathering in Dubai for the fourth World Government Summit. It’s a bit surreal to talk about world government these days, given the recent setback to the United Nations’ efforts to get Syria peace talks off the ground, and the undeniable failures of governments across the Arab world to provide stability and a modicum of freedom to their citizens. Clearly, too, the summit is part of the United Arab Emirates’ relentless pursuit of its global brand. But it is also about the UAE’s desire to set a more positive agenda for the Arab world.